Tuesday, October 17, 1989 seemed to be just another typical sunny afternoon in the beautiful San Francisco Bay area. After concluding my last counseling appointment for the day, I left the church office to pick up my 8 year old daughter from school. Glancing down to see the time, my bare wrist reminded me that my watch had been broken a few days earlier. I figured we had plenty of time before dinner and maybe this was a good time to shop for a new one. As we began our drive toward the shopping center, I noticed that traffic was not as heavy as usual on the Nimitz, one of the nation's busiest freeways. At first, I was puzzled by the near empty lanes, but then chuckled as I figured out why. Just across the bay, at Candlestick Park, the first game of the world series was about to begin, featuring our own bay area rivals, the Oakland A's and the San Francisco Giants. Many commuters had simply left work early so not to miss the "battle of the bay" on TV. By five O'clock we were browsing at the display counter of a large department store. I was about to make a purchase of a new watch when I was distracted by a faint vibrating sound in the distance. I turned around and to my shock the vast concrete floor began to roll up and down, like ocean waves. Suddenly the lights went out. We were immersed in darkness amidst horrifying, violent sounds -- crashing, rumbling, shattering glass, screams of terror. I was stunned by the sudden jolt, but realized it was an earthquake -- a major one. There was no chance to run -- no safe place to go. Quickly, I threw my arms around my daughter and pulled her to the floor. The building was crumbling -- pieces of the ceiling were falling down around us. There wasn't enough time to be afraid. With arms clenched tightly around her, I thought, "This is it." Calmly, I braced myself and whispered, "Dear Jesus, Dear Lord Jesus." Sixteen seconds later the violent shaking stopped. And for another few seconds there was an eerie silence as though everyone was momentarily dazed from the impact. Taking a deep breath, I grabbed my daughter's arm and quickly dashed to the exit. Though severely damaged, our building had survived and amazingly, no one was seriously injured. Outdoors, sirens were heard from all directions. Smoke was seen rising from distant locations. The only thing we knew for sure was that it was a major quake, and that we were OK. But the fate of our friends and loved ones was uncertain. Power was off everywhere -- all phone lines were dead. Once in our car, we heard radio reports of the widespread devastation. Traffic was jammed everywhere. All stop lights were inoperable. The freeway was bumper to bumper, completely halted -- motorists were unaware that further down the doubled decked highway, it had completely collapsed onto the lower level. After several hours, we finally managed to make the ten mile journey home, using back roads and streets. Thank God, I found my wife safe and sound and our home was not seriously damaged. But regrettably, what became known as the 7.1 Loma Prieta Earthquake, was responsible for 67 deaths, thousands of injuries, and cost 6 billion in property damage. 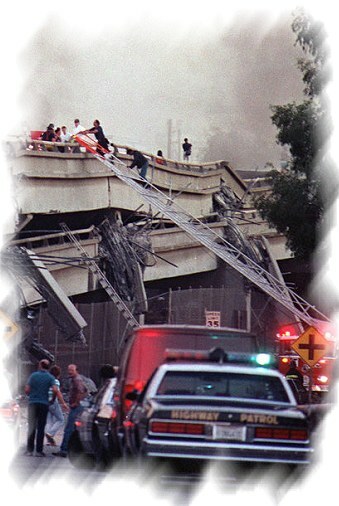 The church I pastored was just five miles from Oakland's Cypress street overpass, which collapsed killing more than 50 motorists. A parent of one our elementary school students, was killed, and many of our church members barely escaped with their lives. A church board member had just driven over that section of roadway, and watched the freeway collapse in his rear view mirror! The photo that accompanies this article was taken from Cypress street just minutes after the quake... while at the same time, I was just a few miles South attempting to use a pay phone to reach my wife. The events of October 17th was a vivid reminder that Jesus said earthquakes would be one of the significant signs of the last days, signaling His soon return. "...And there will be famines, pestilences, and earthquakes in various places" (Matthew 24:3-7). For residents of California, where tremors are common, this forecast might not seem like a big deal, except that earthquakes were a rare occurrence when Jesus made His prediction. Earthquakes didn't happen often, but when they did, many became fearful and viewed them as warning signs of God's judgement. Since the first century, earthquakes have become more frequent and more diverse. In fact, more quakes occur today than at any other period in history. In the past ninety four years 2,115,811 have been killed in earthquakes, the highest number of such fatalities ever recorded. Not only that, but most of those deadly quakes have occurred in the last two decades. Today's frequency of earthquakes tells us that we are in the era of which Jesus spoke. Each tremor and quake further testifies that Christ is coming soon. How urgent it is that our hearts be ready for the return of our Savior! "Now when these things begin to happen, look up and lift up your heads, because your redemption draws near" (Luke 21:28). This article (VL-602) is copyrighted © by Dr. Dale A. Robbins, 1990-2019 and is a publication of Victorious Publications, Grass Valley, CA - Nashville, TN. Unless otherwise stated, all scripture references were taken from The New King James Bible, © Thomas Nelson Inc., 1982. You may download this article for personal use as long as you retain credit to the author. Obtain permission before reproducing copies for any reason, by filling out our simple use permission form. Many of our writings are also available as free pdf tri-fold pamphlets, which can be downloaded for reproduction from our Online Catalog. For media reproduction rights, or to obtain quantities of this title in other formats, email us. If you have appreciated these online materials, help us reach the world with the Gospel by considering a monthly or one-time tax-deductable donation.